Material thickness is often confused with coating- or layer thickness. With layer thickness we speak about one or multiple layers attached to a substrate. With material thickness we speak about the actual thickness of the substrate itself. 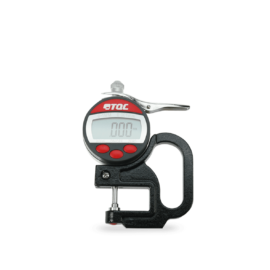 Sometimes the material thickness can be measured easily using mechanical measuring tools like callipers or other simple means. However in certain situations the accessibility of the measuring spot is not suitable to use mechanical tools. Think about a wall of a ship or vessel or the mid section of large (steel) plates. In these situations ultrasonic measuring devices or wall thickness gauges are used to accurately determine material thickness. Important is that the material has a higher density like for example metal or plastics. Materials with lower densities like wood or concrete are hard- or impossible to measure with these instruments. Also the material has to be homogeneous. Plastic or epoxy can be measured without any problems and so can glass. However glass fibre reinforced epoxies are impossible to measure since these are two different materials with different densities. The third criteria is that probe and material have to make a very good contact. Very rough surface may cause problems in that respect. The aid of couplant gel is a must in most application. 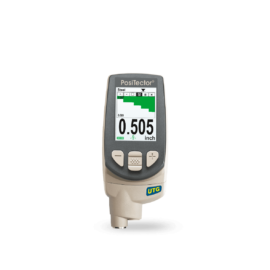 Most ultrasonic gauges allow the user to set the ultrasound speed of the instrument. The ultrasound speed of many materials is known and can be retrieved from the table hereunder. 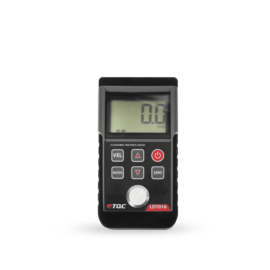 When the ultrasound speed of the material is unknown and it meets the earlier mentioned requirements an ultrasonic wall thickness gauge can be calibrated in a simple way. Just take a piece of the material to be measured with a known thickness. Place the instrument on the material and adjust the thickness reading to meet the actual thickness of the sample. The instrument will automatically calculate the corresponding ultrasound speed of the material so that speed setting can be used for future measurements on the same material.